Purple Podded Pea has attractive ornamental pink flowers followed by gorgeous purple pods. A must have if you want to add some colour to your vegetable garden. Have a look at our full range of seed packets and buy your seeds now, so you can grow some unusual varieties of flowers and vegetables too. 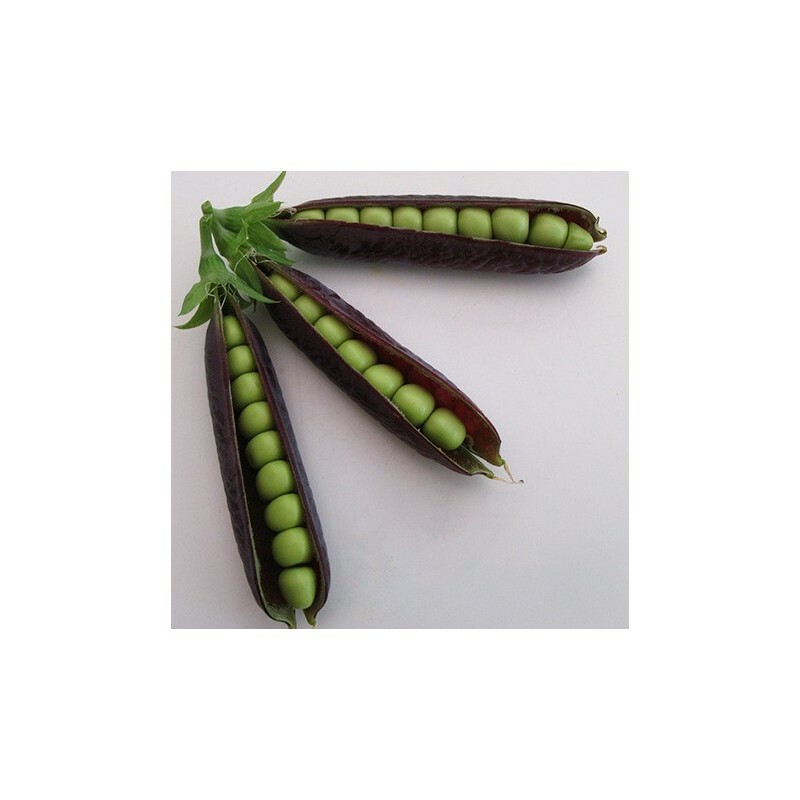 Purple podded pea is a maincrop variety, good production and the pods can be eaten as mangetout if picked very young. The plants are vigorous and will need some support during the growing season, they can reach 2 metres in height. 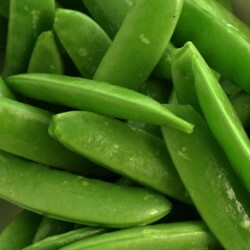 The peas inside the pods are green and turn purple as they mature. 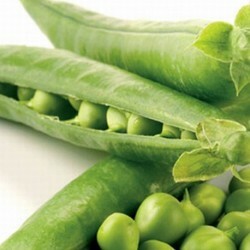 Peas need a sunny location and well-draining soil. Most varieties produce runners (some hybrid varieties are bush-growers) and the planting location will need to provide ample space for stakes or trellises to support the pea plants. Companion planting peas with sweet corn or sunflowers is a way to provide support to the vines while producing another crop in the same garden space. When companion planting, make sure both plant species have the same soil, light and water needs. 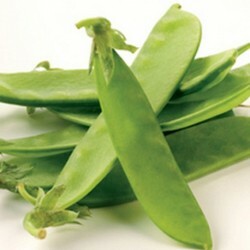 Plant peas as soon as all danger of frost has passed in the early spring. If soil is workable prior to the last predicted frost date in spring, go ahead and prepare the soil and get pea seeds planted. When/if a frost is predicted, cover the pea seeds or young plants with newspaper the night before the predicted frost and remove covering as soon as the sun is up the following day. By using a raised bed to grow peas in, you can plant even earlier since the soil of a raised bed warms up earlier than the soil in an in-ground garden. Raised garden beds are also easier to cover in case of early or late frosts. Till the soil in the planned pea patch to the depth of 8-10 inches, then apply a 2 inch layer of compost and lightly till it in. Peas have a shallow roots system and won’t need soil tilled too deeply. Rake the top 1 inch of soil over to the side of the planned pea patch, smooth remaining soil level and remove all debris from soil surface. Soak pea seeds in water overnight before planting. As members of the legume family, pea seeds are hard and tough, the overnight soak will soften them and enable them to germinate quicker. Sow the soaked pea seeds thickly into the prepare soil by broadcasting them over the garden soil, then take the reserved soil that was raked over to the side and broadcast it over the pea seeds. Peas will germinate within 1 week and plants will be very close together, but don’t thin them out. Sowing pea seeds for a thick pea patch provides several benefits that will help you get a more abundant harvest. Thickly sown peas will shade out weeds, help the soil retain moisture, and help the soil stay cool on the shallow roots and allow you to grow more peas in a smaller space. The alternative to sowing the seeds is to companion plant them with sweet corn or sunflowers, if you choose to companion plant them, first plant the companions and when they are 6 inches tall, plant 2 soaked peas seeds beside each corn or sunflower stalk. 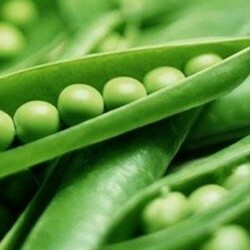 Garden peas are very light feeders and will not need any food other than the initial application of compost which was worked into the soil at planting time. If you do give them an application of fertilizer, you risk the loss of pod production and make plants more susceptible to frost damage. Never allow the soil in the pea patch to dry out, but skip the light watering too. Water deeply once a week during times of no rainfall. When pods are maturing during the heat of summer, a daily deep watering may be needed to keep peas developing and ripening on schedule. The shallow roots of pea plants dry out quickly and all bare soil in the pea patch should be covered with mulch to keep the soil and plant roots cool and moist. When pea seeds have been thickly sown very little bare soil should be visible, but anywhere soil is seen, add a 2 inch layer of organic mulch. Aphids are the only pests that attack peas and the little green sap-suckers are easy to blast water with a burst of water from the water hose. Be sure to check on the underside of the plant leaves for aphids, that’s their favorite feeding location. When the pod is round and a bright, shiny purple colour it’s ready to harvest. A dull green color indicates the pod is past its prime. But the purple podded pea of course will have shiny purple pods. Carefully snap or snip the pods off the vine while holding the vine with the other hand. The shallow roots make it easy to pull the plant out of the soil when harvesting ripe peas if caution is not used.